Welcome to Rodney Leon Architects award winning architectural design firm based in New York City. The firm founded by architect Rodney Leon, specializes in Cultural, Religious, Residential, and Urban Planning projects in the U.S. and abroad. Please visit our portfolio and feel free to contact us for additional inquiries. 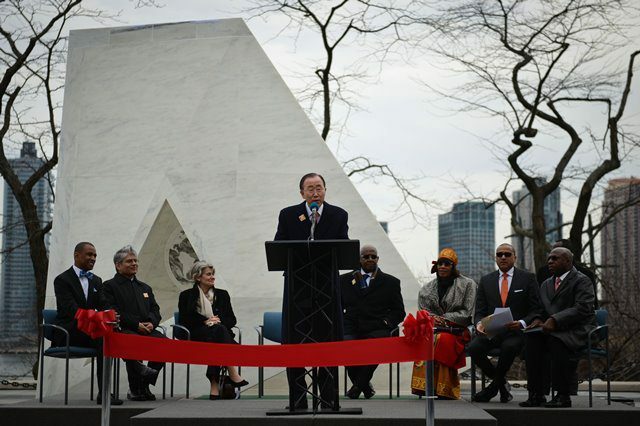 UN Secretary-General Ban Ki-moon (C) speaks during the unveiling ceremony of a permanent memorial named “Ark of Return” to honour the victims of slavery and the transatlantic slave trade, at the UN headquarters in New York, on March 25, 2015. Haiti’s housing shortage is acute, with homeless camps growing instead of shrinking as even more people leave standing homes in search of aid or unable to pay rent. Others are afraid to return to the thousands of homes rated safe to enter, unsure of whether another quake will come.